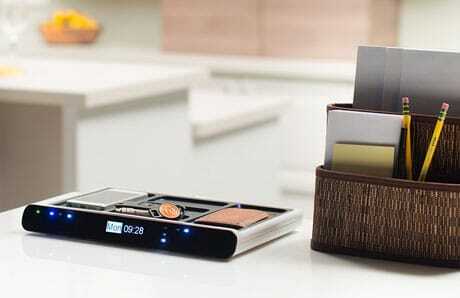 US startup Ocho has unveiled an NFC tray that enables messages to be automatically sent to users, family members and colleagues when a key, wallet, phone or other NFC tagged object is placed on the device. 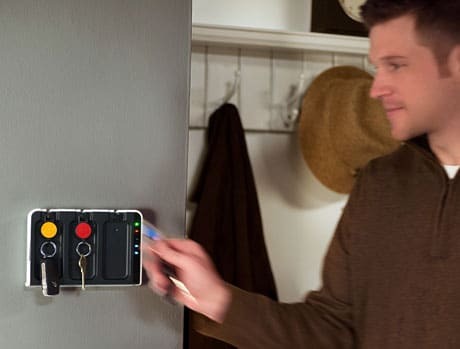 The US$38 Ocho Mini and US$68 Ocho Pad work in conjunction with NFC tags, a mobile app and a cloud-based platform and use a concept the team calls “UnTouch” to enable alerts to be sent out if an event — such as placing a set of keys on the device — does not take place at the expected time. Using the UnTouch concept, he explained, “we can trigger events when a key is touching Ocho or when it is not. I can remind myself at 8pm that my wallet is not where it ought to be instead of having to search for it after I’ve left home. As well as using NFC to detect the arrival of items on the devices, Ocho trays include WiFi to communicate with the cloud backend and infrared sensors to detect when objects are removed. Ocho is based around an open, cloud-based platform that developers will be able to use to create additional use cases, the team says. “When programmers around the world put their heads together, their imagination is the only limit to the usefulness of the Ocho ecosystem,” they say. The team is seeking US$35,000 in crowdfunding via Kickstarter to put Ocho into production, with fundraising due to begin on 26 March.